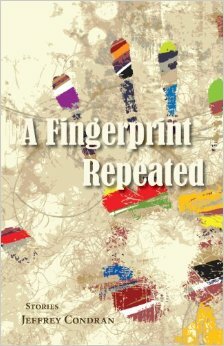 A Fingerprint Repeated by Jeffrey Condran. Isn’t this a great cover? But besides that, I really enjoyed several of the stories in this collection, including “Praha,” which appeared in The Missouri Review, and “Housewarming.” Most of the stories are linked in an unusual way–they feature a character who us Muslim, often from an unspecified Middle Eastern country. The character might be an estranged spouse, a cuckold, or someone under investigation (or arrest) for shadowy ties to terrorism. I’m not too clear on the point of these links, but continued to be surprised by them as I read through the book. Of the collection, Steve Yarbrough says “Condran possesses an admirable ability to imbue isolated encounters with mystery and suspense.” Indeed, these encounters frequently are mysterious. It’s an unusual–and therefore interesting–collection.